Viewers of Coingrader Capsule know we test modern holdering companies, especially against the widely held half-truth / half-myth that early graders were more conservative than those of today. You can view several posts about that in Coin Update. 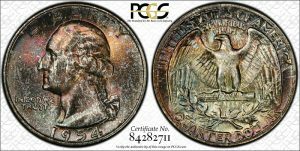 In the end, the earlier graders may have been stricter more often than not, but also more inconsistent than top-notch graders for PCGS and NGC. So I decided to crack out and test these quarter dollars, all toned in various degrees and housed in early ANACS holders. These were among the first holdered by the oldest grading company. At first, ANACS issued certificates and grades beginning in 1979, and by 1988 developed these sealed holders with the word “ANACS” in faded blue on white labels. 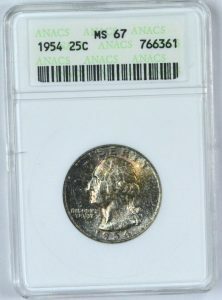 I won the next coin, a 1951-S at MS-66, with a bid of $40, or $46 realized price. 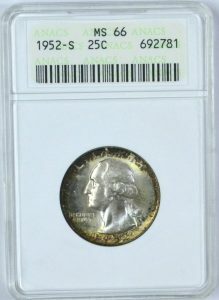 It graded MS-65, worth $50. It might bring as much as $75 with that toning. 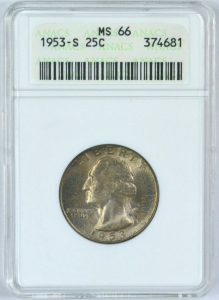 The next is a 1952-S at MS-66, won with a bid of $40, 0r $46 with BP. 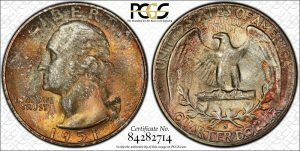 PCGS graded this MS-65, again worth $50. I anticipate a premium because of the toning. 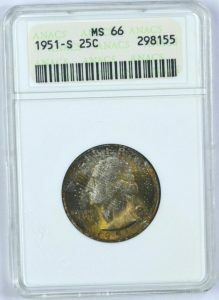 I won this 1953-S at MS-66 with a bid of $20, or $23 with BP. 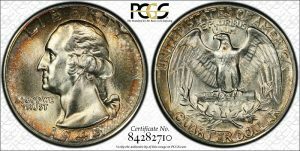 PCGS graded it MS-65, worth about $20. I think I’ll get $30 because of the toning. 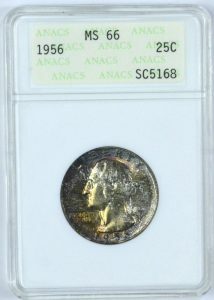 The final coin is a 1956 at MS-66, won with a bid of $20, or $23 with BP. 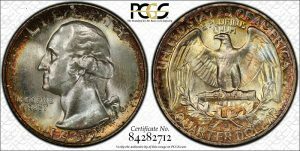 It graded MS-66, worth $35. Again, I anticipate a premium because of the toning. 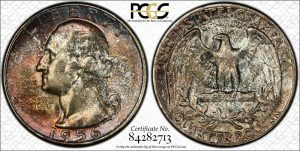 So in the end, four of the six coins were graded lower by PCGS. (I agree with three of the lower grades.) The point being, once again, that early graders—and ANACS graders were among the earliest—were good, but they were actually more generous in grades than the top graders today. What does this mean? 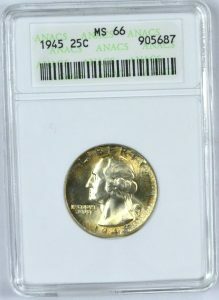 Bid cautiously on early ANACS coins. Rely on your grading acumen rather than the age of the holder. 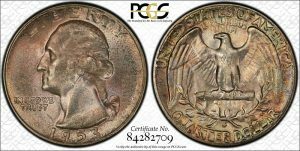 All these coins are right for the grade during those times but eye appeal is the boss right now,there is only one coin here that is not ugly.